OK. New government health advice. We eat too much [we know this]. We must restrict our intake to 1,800 calories per day. The recommendation is 400 at breakfast, 600 at lunch and 600 at dinner. Great. I watched the ‘experts’ on a daytime news programme showing us how this looks in terms of meals. Breakfast was a child’s bowl with porridge and a few blueberries. Lunch was two miniscule ‘spinach’ muffins and some tiny, doll’s house dishes with miniature tomatoes and a strawberry. Dinner was another child’s bowl with some chicken risotto. The expert generously suggested that the risotto could be accompanied by a small side salad. There, readers. Don’t eat it all at once. Here at Lessageing Manor we don’t actually do breakfast, which leaves us a whole 400 extra calories to have at lunch! Whoopee! It is certainly true that Husband and I have consumed too much during the winter and have been attempting to correct the ensuing spare flesh by cutting down on carbs and so on. But I can’t help feeling that these suggestions of tiny, dolly-sized helpings are not going to convert the mountainous, British obese into svelte, MacDonald and KFC refuseniks. In other, dangerous-food-related news there was a long, detailed item on the subject of that most lethal of breakfast staples: BACON. Some time ago the demon bacon was heralded as the greatest poison known to man and the consumption of it foremost in the list of behaviours most likely to cause bowel cancer. Like many such revelations this is not a happy discovery for those who’ve based a lifetime of breakfast experiences upon it. This bacon scare, having frightened devotees of the ‘Full English’ enough to prompt a boycott of the sausage/ham/cured meats aisle then appeared to die away and bacon consumers resumed their perilous habit, returning to Greggs for their bacon rolls and Burger King for their additive rashers. Now however the bacon threat is re-awakened. This is not due to bacon itself, or any other treated meats, but the mass-production technique of adding nitrates to them. Following advice, I prowled the aisles of Waitrose in pursuit of nitrate-free bacon and ham, with limited results. Every day, it seems another food aisle is closed off. Don’t go near biscuits! Keep away from crisps! Touch fizzy drinks at your peril! Don’t touch fruit juice with a barge pole! It’s no to alcohol, bacon, carbohydrates [especially evil sugar], processed foods, red meat and fruit! Fruit, apparently will not only make you fat but will simultaneously rot all of your teeth. This is the single most depressing news amongst all of it. Perhaps the simplest approach would be for our health gurus to suggest what would be acceptable for us to eat and drink. What would they say was alright? I’m guessing kale, lettuce, lentils and beans washed down with water would be the answer. Am I right? What’s Cooking on the TV? In its wisdom, the BBC has opted to schedule on Channel 2 a big, blockbuster ‘food season’. This is much heralded and promises to inform in ways we have never before been informed about-food. Yawn. Really? How many more programmes about food can we take? And how many more times must we be told that refined foods, salt, fat, fast food, takeaways, sweets, chocolate and the demon sugar will be the undoing of us? Let me see. ‘Masterchef’, ‘Hairy Bikers’, ‘Nigella’, ‘Saturday Kitchen’ and on and on-the programmes exhort us to produce more, varied and extravagant meals using more, varied and exotic, unheard-of ingredients. We sit and watch, munching our takeaways or our toasted cheese sandwiches and nodding-‘mm, yes, that looks nice’. How many viewers rush out to the supermarket next day for Tahini paste, syrup of nasturtium seed or essence of wild boars’ scrotum? How many search online for a high temperature vacuum bath or a freeze-drying machine? Heston Blumenthal has much to answer for. It was all vastly simple decades ago. My childhood diet followed a weekly timetable that varied little beyond which meat to cook for a Sunday roast or what was available in the back garden vegetable plot. Mondays would yield up something with the remains of Sunday’s roast, the remaining days repasts would revolve around Spam-with mashed potatoes, with chips, with beetroot or eggs from the hens at the end of the garden-omelettes, fried eggs and mash or chips. We children never questioned or grumbled. We had no dislikes and would clamour only for an orange or a banana since these were prized items [rationing was not yet a distant memory], although as I’ve mentioned before we were only permitted a banana if it was accompanied by a slice of bread. If the first course was a little sparse there would be a vast rice pudding or a suet sponge for the purposes of filling us up. Meals always consisted of two courses. Not only did we survive on this regime, but we were relatively healthy and never became in the slightest bit overweight, still less obese, even though the occasional day out to the seaside would conclude with fish and chips wrapped in newspaper. How ironic that the more elaborate and fiddly TV chef meals become, the more the population capitulates to fast food and fry-ups, snacks and sweet treats. Here in Portugal, where we have fled to escape the UK’s wintery temperatures we de-camped on our first evening-after five days of driving- to the village restaurant where we were shown a box containing assorted, gargantuan fresh fish, from which we selected our favourites. They were taken away and grilled with a little salt and served with a salad, crusty rolls and a plate of fried potatoes. No sauces, ‘beds’ of anything, snotty-looking foam or those stupid drips and smears dotted around the plates. The result? Completely delicious. Out Damn Sugar! Out I Say! Sugar is the new evil. What a revelation! Every day there is a press article revealing some new disease, some new side-effect or some new and sinister ill that sugar has wrought. Yet who in the world could not, by now, know that sugar is not good for you, makes you fat, rots your teeth, gives you diabetes etc? Just as everyone is aware that burgers, chips and pizza should be consumed in moderation, so we know it is the same for sugary products. Strangely, though, knowing these things is not enough. You have to care that sugar and fat are unhealthy to do anything about them, too. Eradicating sugary and fatty foods from your life is tedious beyond belief. You have to watch others consuming slabs of cake, portions of chips, ice creams or creamy desserts whilst sipping black coffees or nibbling on a lettuce leaf. You have to sustain this regime for what seems years. You may not ever slip from a religious observance of ‘no sugar, no fat’. It is never enough to undertake vast amounts of exercise; to run miles each day, leap around aerobically, swim, dance and lift weights. Sugar will still be bad. It will, at best, rot your teeth. As a child I was not denied sugar, neither was I obese, although during my teens I did have so many teeth filled [with lethal amalgam consisting of, amongst other substances, mercury] I was like a walking barometer and you could almost tell when a storm was coming by staring into my open mouth. The fillings were not a result of decay. No, they were the outcome of a rush of enthusiasm by my national health dentist who was, at that time, paid handsomely for each filling he could complete, regardless of need. That this is now needing to be expensively addressed has been described in a previous post. My father grew a lot of vegetables in our sprawling garden. There were hens at the end of it, obligingly providing eggs; [unlucky ones, on occasions would also provide the Sunday roast]. The odds and ends of discarded fruit from my uncle’s market greengrocer stall provided us with treats, although we were never allowed to consume a banana without an accompanying slice of bread and butter. We were always given a ‘pudding’-usually something carb-laden such as rice pudding [we fought over the toffee-like skin that clung to the sides of the dish], suet apple pudding or jam roly-poly. These starch fests were to fill us up. We were not chubby children. It would only be fair to say that these days, here at Schloss Lessageing, the family home and domestic hub that houses us, domestic chores and hum drum routines are shared on an equal basis. This is not to say that there aren’t tasks which one or other of us has adopted as routine, or that one task falls under an individual’s remit more than another. Husband, for instance is more inclined to put dustbins out for collection each Sunday night, although I do undertake this job on occasion. It is interesting to note, however that when neither of us is present the bins experience a less regular evacuation. On one occasion I discovered, while tidying the garden, the corpse of a cat, which I’m sorry to say I dealt with by manoeuvring it into a plastic bag, wrapping it in a number of layers of newspaper plus more plastic bags and depositing into the refuse bin. [I’m aware that this appears callous, but time and opportunity did not allow for a more dignified disposal]. On our return I gathered that this bin did not get emptied for several weeks, resulting in a powerful stench as the said corpse deteriorated. Luckily our neighbours are still speaking to us. Meal preparation, vacuuming, laundry, polishing of furniture-these are all chores which are designated either/or. This way we all get some time off for good behaviour, although myself, I do not hold the same contempt/disregard/reluctance for domestic tasks that I had as a proper working person, in fact I may even, on occasion derive something approaching satisfaction in their execution. This is because it is possible to accompany chores with pleasurable activities such as radio listening or story composition. In other words, they are mindless and allow the brain to think about anything one likes. But I am not so far removed from the world of proper work to have forgotten how utterly exhausted I used to be on my return each day and also at weekends [when it would take until Sunday night to recover from the rigours of the previous week]. So the news that Dyson, the vacuum cleaner manufacturers are pouring mountains of cash into research into a variety of domestic robots seems, on the face of it to be encouraging-that is, until you look forward to the time when these domestibots begin to be commonplace. You will be able to sit watching the TV while the hooverbot revolves around the room. Your only movement will be a slight lifting of the feet as it nears the sofa. You will be able to read a magazine as the tablebot clears the plates; only needing to raise your paper as it takes your plate. You may lie, comatose on your sun-bed as the mowerbot beavers up and down the lawn manufacturing its perfect stripes, and you can continue with your next level of ‘Candy Crush’ as the refusebot empties the bins, the laundrybot sorts the garments and the chamberbot makes the beds. And if you are very, very lucky the hoistbot will come along and lift your [by now] obese form from its dent on the couch and transport you along to the hospital for your heart transplant. What’s not to like? Fast food is too cheap. It is also too easy to obtain and too gratifying. It creates weight gain, litters the streets with non bio-degradable cartons and contributes to health problems. When you walk past a ‘Macdonalds’, a ‘Pizza Express’ or a ‘Kentucky Fried Chicken’, how often is it unoccupied? The abundance of food takeaway outlets in any shopping street is testament to how popular they are. Not only does the country need to raise revenue to address the debt left by the bankers [who have not been asked to make recompense-but that is a different issue], but it needs to reduce the burden on the National Health Service. So why isn’t there a substantial tax on fast food? If fast food were taxed so that prices were in line with average restaurant prices, the revenue could be used in any number of ways. It could, for instance be used to subsidise the cost of fruit and vegetables; or it could supplement the support we currently provide to developing countries, where finding enough to eat is their problem, not overeating! It may be a generational thing, but I’m not tempted by Macdonalds or Burger King. I did try a ‘Big Mac’ once or twice, but the experience was akin to chewing on a piece of lumpy rubber sandwiched between two bath sponges, accompanied by a bag of nasty, salty, fatty, greasy little sticks. I tried the ‘root beer’ –a strange, straw coloured liquid tasting vaguely of chemicals. We have been lured into Macdonalds on occasions when travelling by their claims of free internet access. We would only need to purchase a coffee to use the facility. Sadly, though, the access is rarely available. It has usually ‘crashed’ or the signal is too weak to get an email or anything else. The coffee, to be fair, is palatable. Similarly, I tend not to choose pizza when dining out. What an incredible profit there must be on these large circles of stodge and fat, for there to be so many pizza outlets and takeaways! It must be the easiest, cheapest way to make a buck in the food world! A couple of weeks ago, on a whim, I thought I’d give pizza making a go. I’d made versions of pizzas with children before, but using bread mixes, grated cheddar and such items as might be transfigured into ‘faces’ and so on. This time I was going to make proper, grown up pizzas with mozzarella et al. I used a BBC recipe. Reader-it was easy. Even the bases, formed from a yeasty dough mix, were simple. And what about the famous Colonel’s chicken? The advertising alone is enough to induce a grimace. There is nothing recognisably ‘chicken’ about the images, which portray blobby orange lumps protruding from bags or boxes and accompanied by the ubiquitous, greasy, stick-like ‘fries’. I believe if apples were to be individually encased in gaudy packaging that also included a plastic action figure toy they would become objects of desire to children. But shouldn’t kids be wanting to eat because they are hungry and because the food they are offered is delicious? We British, apparently, are the porkers of Europe; and not far behind [excuse inadvertent pun] the US in world fatness tables. Horrors! Why are we all so fat? And what is to be done about it? ‘Too much access to fast, fatty, sweet, calorific junk!’ shriek the health gurus. ‘Not enough activity!’ scream MacDonalds, Burger King, Pizza Hut, Kentucky Fried, Cadbury’s et al. Blame the schools! Blame the parents! Blame food manufacturers! 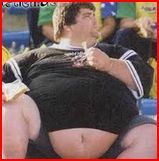 Blame the fast food outlets! 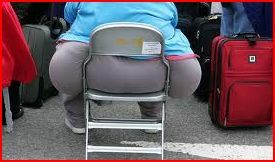 Film clips accompanying news about obesity are always shots of portly, overspilling pedestrians on the street, usually their middle portions, showing how their flabby tummies are barely contained by their clothing and their bottoms and thighs wobble as they lumber along, or seated at cafes tucking into clandestine mountains of chips. I’ve always wanted to know whether anyone recognises themselves when these clips appear. For instance, take the young woman in picture 1, pushing the pushchair. 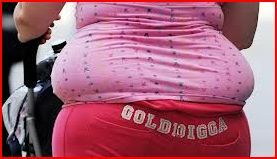 She is wearing a very distinctive, eye-catching ensemble…a spotty pink tee shirt and hot pink, ‘GOLDIGGA’ trousers-not hard to identify. The gentleman in picture 2 seems, from his outfit, to be about to take part in a sporting event, although it is difficult to imagine which one. Can he have checked his look in the mirror before leaving home? Indeed, might he have reconsidered his wardrobe choice had he realised he’d be caught on camera? I’ve more sympathy with number 3, given that she is, in all likelihood in transit, hence her choice of clothing [and the surrounding luggage]. She also clearly has no idea of how she looks from the rear view, particularly posed on a small chair [or perhaps a normal sized chair that is dwarfed by her ample derriere]. How can it be comfortable for her to be bulging over the edges in that way? She presents the overall impression of a string of grey, budget sausages. Number 4 has been captured in the very act of scoffing! What did she say to her loved ones when her image was broadcast to the nation? That it was a case of mistaken identity? That she never eats lunch? No, I’m sure that unless these unlucky portrait subjects were exhibitionists they would have been unlikely to sanction the use of their corpulent bods to illustrate negative reports on obesity. So it follows that they were the unwitting victims of the papparazi lens, which is a discomforting thought-because today, or tomorrow, or next week it could be you or me. And I don’t know about you, but though I do not consider myself to be obese, I am not the whip-thin little wraith I once was…but then…as I said in a previous post…I never look in mirrors, so I might not recognise myself after all.